A random collection of Up-Do’s I usually do once I have pulled off a certain style for a while and am about to wash my hair. I also do Up-Do’s when I have stretched out my curls but can not be bothered to do a particularly time consuming style. 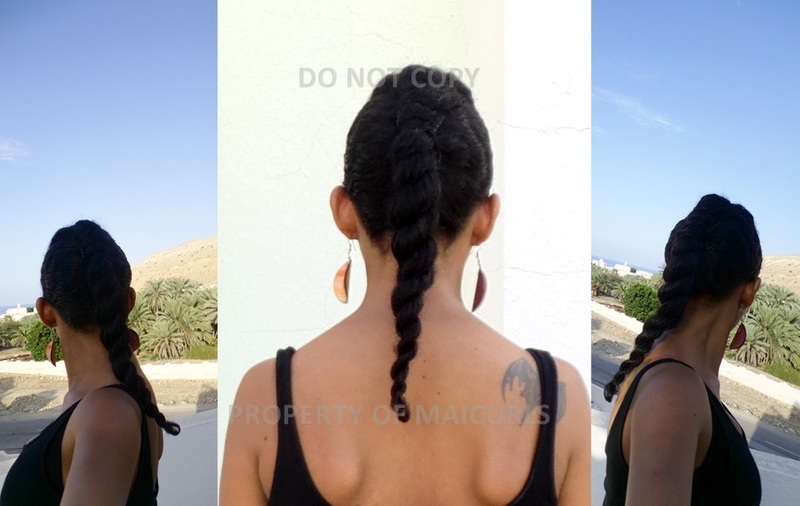 Stretching my curls helps me to keep them untangled so even if I do not plan on doing anything intricate I sometimes stretch my curls by doing chunky braids on dry hair, sleep with them in overnight, take them out the next day and randomly pin my hair back. In All honest there is no “method” to my Up-Do’s. I just pin my hair back with bobby pins, sometimes twist and turn my hair but I do tend to tuck my ends away so they are protected. After rocking my wash-n-go for a few days I will basically just pin it up with bobby pins. No fuss! Similar to my Wash-n-Go Updo I will pin up my hair with bobby pins after rocking a twist out for a few days. Again no fuss! I moisturized my hair with my (creamy) Leave-In Conditioner, seal with a little of my Mixed Sealing Oil and lightly detangled. I split the back into two sections, add a little Flax Seed Gel (FSG) to the base and start to loosely twists and then twist tighter towards the ends. Using bobby pins I pin one down and the other up. I split the middle into two sections, add a little FSG to the base and start to loosely twists and then twist tighter towards the ends. Using bobby pins I pin one down and the other up. The front is kept in one twist and done similarly to the others. I add a little FSG to the base and start to loosely twists and then twist tighter towards the ends. Using bobby pins I pin it down at the front. This is a style I did for my Protective Style Challenge. I put my hair into a big flat twist (it looks like a seahorse to me). I do not make the twist too tight. After making the twist I use one bobby pin on the end of the flat twist to tuck away my ends and that is it. I did not use any styling product such as gel because I wanted it to be a little more “effortless”.